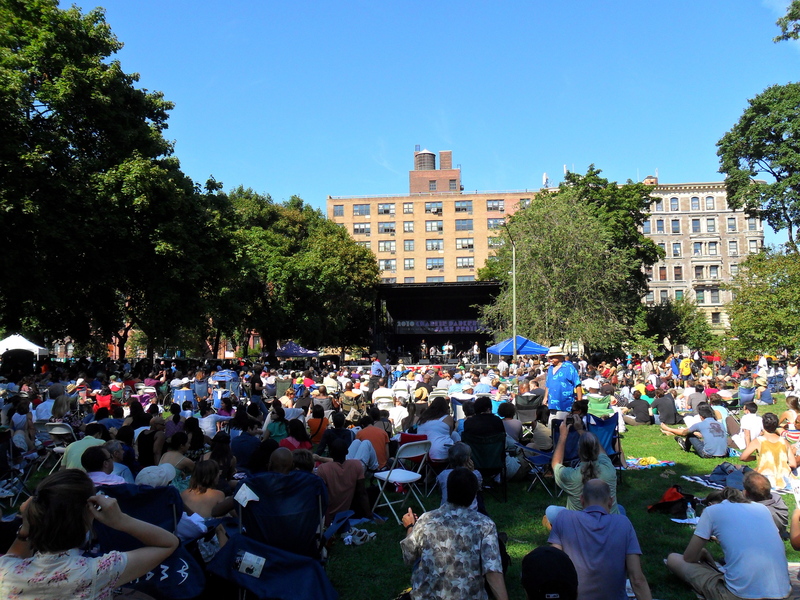 Part of the New York Summer Stage, the annual Charlie Parker festival celebrated Bird’s 90. birthday this year (Aug 29th). 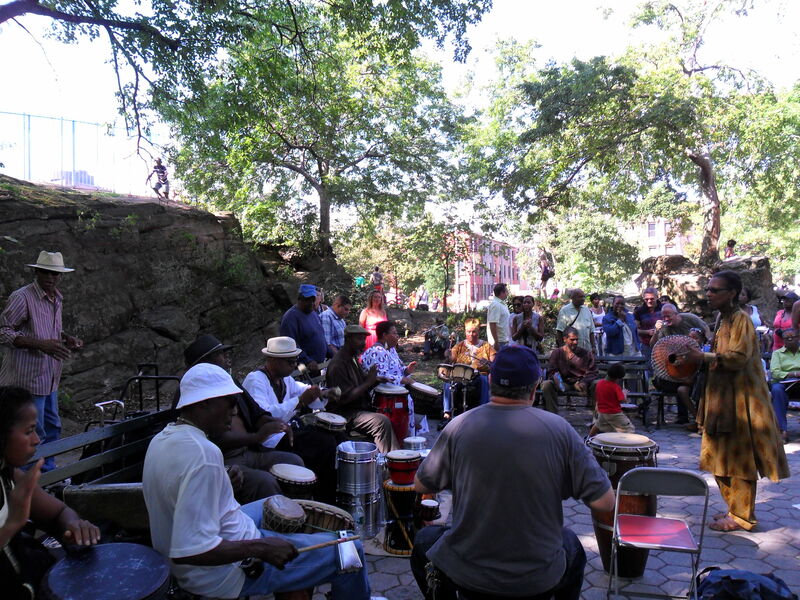 I went to hear the concerts on Saturday @ Marcus Garvey Park, Harlem. I really liked the all-star tribute band MC Raydar Ellis’s Revive Da Live band with Ben Williams on bass (sounded really great), Justin Brown on drums, Jaleel Shaw on alto, Marcus Strickland on tenor, Marc Cary on keyboard, Corey King on trombone, Ingmar Thomas on trumpet. 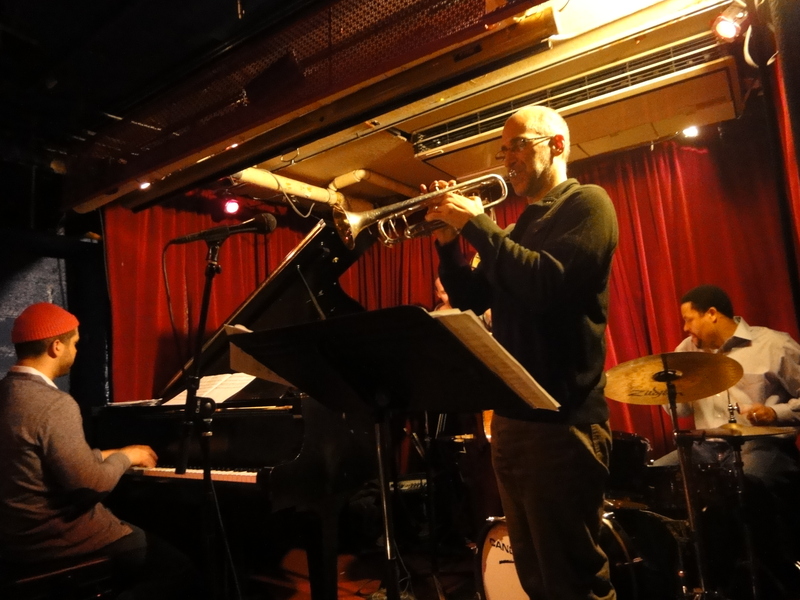 I also heard J.D Allen’s group & Jason Moran’s Bandwagon, which was great because one of my very favorite drummers Nasheet Waits was playing. But I didn’t understand the band leading concept of using old Billie Holiday and Eddie Jefferson tracks and playing along with them. It didn’t sound like a live concert at that point, it felt like the band is having a break. And last but not least, they had McCoy Tyner on solo piano. He played some really nice (mostly original) tunes – Fly With the Wind (he actually played it twice), I Should Care, Blues on the Corner, African Village. A lot of people are saying how he doesn’t have the facility on the piano that he used to, but I think he still sounds totally extraordinary. At 86. And he is actually one of the very few of the real giants who’s still playing, so it’so feels really special to hear him live. This time – entitled Built by MeanRed- was kind of intriguing because there was Jason Moran in the band. In the beginning there was a rather confusing 45minute wait with nice grooves from DJScribe (I Love Vinyl). 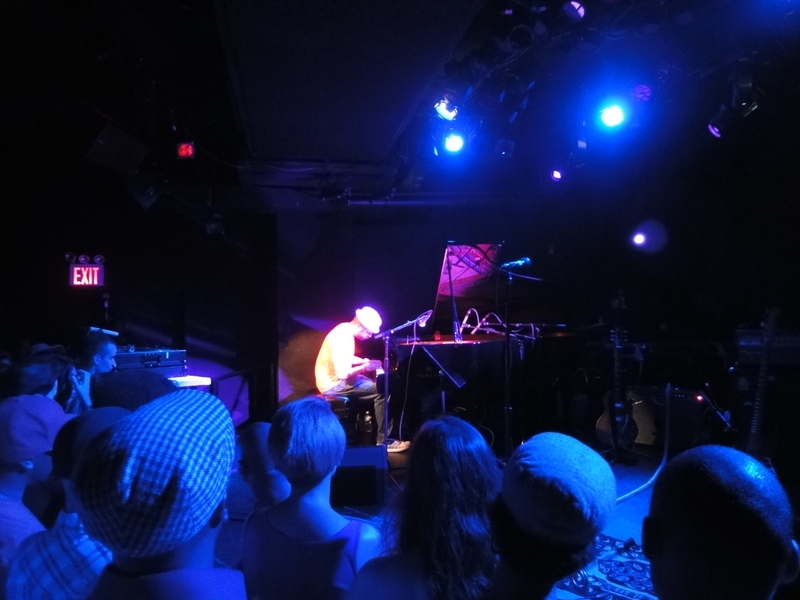 Then Jason Moran’s solo piano warmup performance, which actually was quite unexpected for most of the crowd.. Some of it was actually really interesting modern jazz piano, but was difficult to get into it at that point. He also played along with the DJ a bit, which somehow also seemed a bit confusing at that particular time and place and the way things progressed seemed totally random. And anyway, everybody was expecting.. Meshell………………………………………………………………………………………………………………………. Was great to see Meshell again, and hear her voice, which is just mesmerizing even when just talking, about anything. Jason Moran in the band didn’t get highlighted that much, which was a pity, because some of the things they did together were the most interesting part of the show, for me. But otherwise, I didn’t really dig the punk rock direction that they had with some of the newer tunes. The drummer had more like a rock/punk sound and I thought the groove wasn’t very soulful. 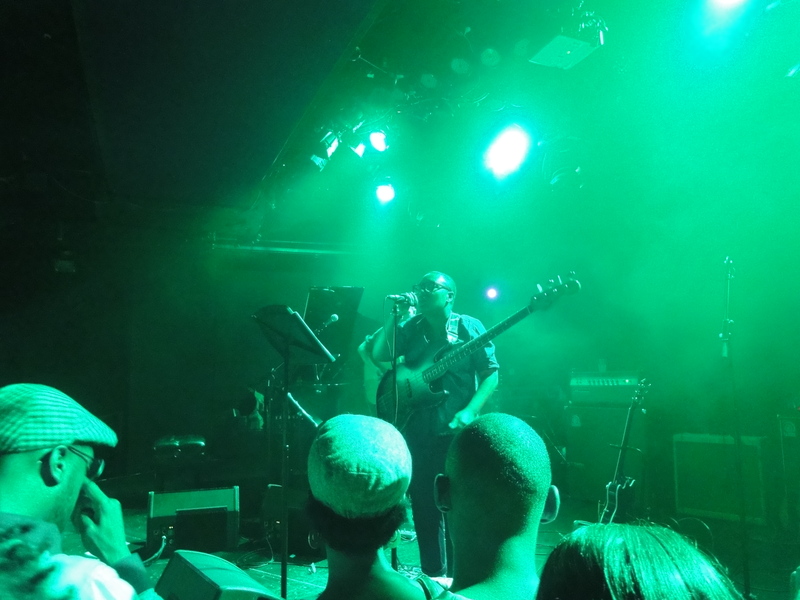 Meshell played quite a lot of bass, which sounded really great. It was great to see the fans – all races, gay and straight, from all walks of life, singing along to old hits like “Faithful” and “Satisfy”. Ha-haa, I guess the names speak for themselves :D. And not just another all-star band, they connected really well. Their last set in the Blue Note, that was a long one – I think they actually played for 2 hours. I liked a Jason Moran composition a lot. How could I hear that tune again? I was really curious about hearing Charles Lloyd again – my first time was in Estonia a couple of years ago during Jazzkaar festival – it was the same band there only with Geri Allen on piano instead of Jason Moran – Eric Harland on drums, Reuben Rogers on bass. I remember it as one of the best concerts I’d ever heard, really profound. This time it was mostly free and rubato, especially the first part of the concert. They played Bloodcount, the Billy Strayhorn tune, originals, finally even playing a really funky R’nB’ish tune. Lot of times it reminded me of Coltrane’s Ballads album. Sounded so organic, full of sound colors and nuance. Charles Lloyd has such a delicate and profound tone. And Eric Harland is just in a class of his own, he sounds like a force of nature, so natural, dynamic, effortless. I got the image of rainfall in my head a lot, listening to him play. In Estonia they played in a church, as different a place as it gets from the Highline Ballroom, which seems to be so much about business – an outrageously expensive place to hear music, in my opinion. $35 music cover for one set, $10 food and drink minimum. Was happy to be joining a party of friends there :D.